Uncle Holland* is written by the same author that brought us Sidewalk Flowers JonArno Lawson. It is based on a true story about the author’s uncle, who exhibits a strong propensity for trouble. For example, he loves beautiful things and at times he cannot help pocketing them! He gets caught again and again and after the 37th time he is given a choice, jail or join the army. He leaves behind a deeply disappointed family and travels to an exotic location where the beauty he encounters isn’t the kind that fits into his pockets. After all this time, Holland learns that instead of stealing, he can paint the things he thinks are beautiful so that he can keep them forever. He is even able to sell them in a local market to earn some money. Uncle Holland is a powerful picture book because the protagonist is not perfect. In fact it is his imperfections and the journey he embarks on which leave the reader rooting for him. When Holland is caught for the 37th time, his brothers and parents become emotional and weighed down with worry. This book teaches us that Holland just has to find his own way. Natalie Nelson’s beautiful illustrations are simple yet emotionally charged. Her use of blank space and use of color is powerful. At first, the illustrations are dominated by black, white and grays with occasional bright bursts of primary colors. When Holland travels south with the army, the setting changes drastically, revealing a world filled with color and wonder. Uncle Holland is perfect for readers ages 4-8. The lesson will resonate with the older readers, while the illustrations will captivate younger ones. Click here to purchase a copy of Uncle Holland (affiliate link). *I received a complimentary copy of Uncle Holland in exchange for my honest review. John Cech’s telling of The Nutcracker is absolutely brilliant. This version focuses on the first night Marie receives the Nutcracker as a present from her Godfather Drosselmeier. It also incorporates how the Nutcracker came to be under the curse of the Mouse Queen. Though parts of the story are shortened to fit this picture book format, this is a wonderful version of this holiday, childhood favorite. When Marie discovers the Nutcracker, she becomes intrigued by him. Her brother, on the other hand, is excited and reckless with him, causing him to break. Marie wraps a bandage around the Nutcracker’s jaw and tends to his injuries. As the festivities wind down and it is time for bed, Marie asks her mom to allow her to stay up a little later. The house grows quiet around Marie and hundreds of mice appear from all over and the toys, led by the Nutcracker, come to her defense. The illustrations by Eric Puybaret convey the action and the drama of the scenes in a gorgeous way. Each illustration uses space in a way that mimics the stage, with characters occupying different layers of depth. The Nutcracker is ideal for older kids, ages 7 and up, because there is a lot of text and the story itself is long. It can be read aloud over a couple of different sessions leading up to the holidays or any other time of year a young one wants to listen to the magical tale. What is your favorite version of The Nutcracker? Balloons Over Broadway by Melissa Sweet is based on the true story of Tony Sarg, the original puppeteer of the Macy’s Thanksgiving Parade. This is a beautiful narrative nonfiction story that integrates biographical story telling along with creative problem solving which resulted in the creation of one of New York City’s most praised annual events. When Tony was a young boy, he loved studying how different things worked. He had the chore of feeding the chickens at 6:30 am. Like most kids, he dreaded the task, so he designed a chicken feeder so that he could feed them from the comfort of his own bed. As an adult, Tony moved to London and then New York City, where he began creating marionettes with lifelike movements. Macy’s approached Tony and asked him to design the holiday windows for their Herald Square store. The success of the store window led Macy’s to give him an even bigger job! As the holidays approached, they missed their own holiday traditions. In 1924, Tony was hired to create the first Thanksgiving Parade to help celebrate all the different cultures from around the world on the streets of New York City. The first parade consisted of costumes, floats and animals from the Bronx Zoo and was a tremendous success. Each year Macy’s requested more spectacular attractions as the crowds grew and grew. Tony had to figure out a way to solve all kinds of problems in order to keep up with these demands. Inspired by his fascination with engineering contraptions and his experience as a puppeteer, he developed the perfect solution: the Thanksgiving Parade balloons. There are so many reasons I love Balloons Over Broadway. I love that it shows how Tony Sarg was a curious boy with an inquisitive mind from a young age. I love that the Thanksgiving Parade was created in response to people who had immigrated to the United States missing their own traditions and homes. This is so much of what our country’s history is made up of and should not be forgotten. I love that Tony Sarg encountered obstacle after obstacle, which he creatively and skillfully problem solved. Balloons Over Broadway is the perfect narrative non-fiction picture book for kids ages 7-10. It integrates chronological text structure along with problem and solution. It celebrates science and problem solving all for the good of a community. Click here to purchase a copy of Balloons Over Broadway (affiliate link). Ingela Arrhenius’ beautifully illustrated picture book Animals is visually stunning. It features many different animals each rendered in a unique, captivating style with bright colors and whimsy. The large size format of the book is perfect, making the illustrations the center piece of each page. I would hang have each and every page of the book framed and hung in my little Lucy’s nursery, they are that gorgeous! Click here to purchase a copy of Animals (affiliate link). There are so many fantastic New York themed picture books that I’m going to dive right in! 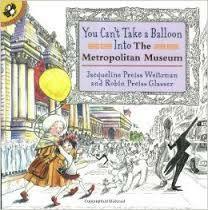 You Can’t Take a Balloon into the Metropolitan Museum by Jaqueline Preiss Weitzman and Robin Preiss Glasser is a wonderful book about a girl who visits the Met with her grandmother. The security guard informs the little girl that she must leave her balloon outside. The balloon becomes untied and goes on a journey in the museum as well as around the city, visiting many important works of art and New York City landmarks. The fascinating thing is that this book does not have any text! Instead, it consists of rich illustrations that effectively communicate the story, including the characters, the setting, the conflict, and the resolution. This book would be great for a reading lesson or a conference in lower elementary grades about referring to illustrations for information to support the story. Another great story is A Walk in New York by Salvatore Rubbino. 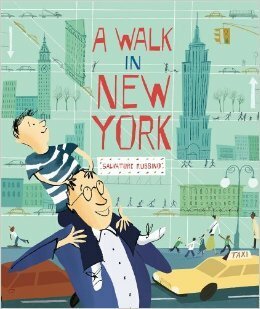 In this beautifully illustrated book, a young boy and his father spend a day wandering around New York City and visiting the different landmarks. The story is written in first person, allowing the reader to share in the excitement and to participate in the adventure of exploring all that this great city has to offer. Interesting facts about each are sprinkled across the pages. This is a great book for use in kindergarten through 2nd grade classrooms. Stay tuned for more New York City themed picture books! Each year when we launch our Social Issues Book Club unit, I begin by letting my students know that social issues exist in most texts they encounter in their everyday lives. For example, even though we may have read Ruth and the Green Book during our unit on historical fiction, it addresses important social issues including racism and discrimination. Another non-fiction example is No Monkeys, No Chocolate, which describes the steps it takes to get chocolate from the cocoa bean, however the social issue of environmentalism lingers beneath the surface. Last year, I wrote a post about Social Issues Book Clubs. This year, in addition to reading The One and Only Ivan by Katherine Applegate, which deals with the social issue of the treatment of animals living in captivity, my colleague recommended Faithful Elephants by Yukio Tsuchiya. Faithful Elephants is a picture book based on the true story of the zookeepers and animals at the Ueno Zoo in Tokyo during World War II. The authorities in Japan feared that the animals in the zoo may get freed as a result of frequent bombings. Thus, they ordered that the animals should be destroyed. 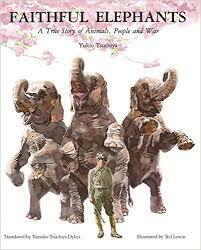 Faithful Elephants is a heart breaking story of loss and tragedy brought on by war. Even the innocent zoo animals became its victims. Again, though it’s a picture book the content is heavy and the tone is quite somber. I’d recommend it for use in grades 4 and up. The majority of my students were already familiar with this story before I read it to the class. Following the read aloud, we had a long discussion about war and how the author’s and illustrator’s decisions in creating the book contributed to our understanding of this social issue. 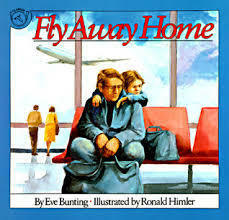 Fly Away Home by Eve Bunting is a picture book that explores the social issues of poverty, homelessness and loss. The story is told from the point of view of a young boy living in the airport with his father. The boy and his father strive to blend in, moving from terminal to terminal and keeping a low profile. Though the setting of the story is dated, Fly Away Home is still quite powerful. One important detail in the story is that the boy’s dad is employed. However, his salary is not high enough to afford rent. At this point students expressed surprise because they assumed all homeless people are unemployed. This opens up an opportunity to correct misunderstandings or assumptions. In my fifth grade class, we do a lot of work with symbolism. At one point in the book a bird flies into the terminal and the boy becomes fascinated by it. By the end of the story, the bird finds its freedom. My students had so much to say about what the bird represents in this story, that I sent them off to write about their ideas and how they connected to the larger social issues in their reading notebooks. Students then had an opportunity to participate in a gallery walk where they read and added on to each other’s ideas. Fly Away Home (Guided Reading Level: P) is a great read aloud for students of all ages, grades 1-5. 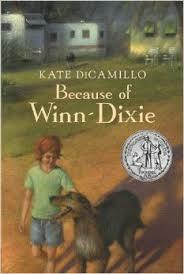 Kate DiCamillo’s Because of Winn Dixie and Tiger Rising feature young protagonists whose experiences and friendships give them the courage to face their pasts. In Because of Winn Dixie (Guided Reading Level: R), Opal and her father, the preacher, have just moved to Florida. Opal is in the Winn Dixie market when she encounters a stray dog knocking down groceries and terrorizing the manager. Before the dog is seized, Opal claims him as her own and names him Winn Dixie. 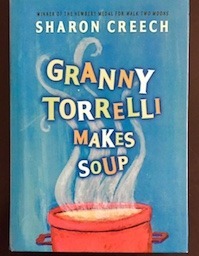 The story follows Opal and Winn Dixie as they form new friendships all over town, including Miss Franny Block (the local librarian), Gloria Dump (an elderly woman who is hard of seeing), and Otis (an ex-con who now works in the pet shop). Opal learns that everyone has a past and that everyone makes mistakes, making this a story about friendship and forgiveness. Through these experiences, Opal finally gains the courage to ask her father the truth about her mother. 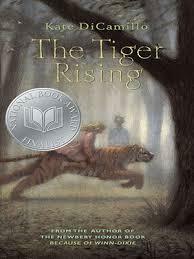 In Tiger Rising (Guided Reading Level: T), the main character Robert finds a caged tiger in the woods behind the motel where he lives with his father. That same day a new girl arrives at school. Sistine is independent and strong, yet stubborn to a fault. Another important character is Willie Mae, the motel housekeeper, who offers Robert and Sistine sage advice. When Robert confides in Sistine about the tiger, she becomes determined to set it free. Much like Opal in Because of Winn Dixie, Robert’s new relationships and experiences teach him the importance of speaking up rather than cramming all of his thoughts and memories into what he refers to as his invisible suitcase. Ultimately, Robert confronts his father about the death of his mother. I’ve read Because of Winn Dixie and Tiger Rising aloud to my 5th grade classes. Both books have strong protagonists that embark on important journeys. Both have engaging plots and casts of interesting secondary characters who impact the main characters directly. Both books allow the reader to learn lessons along with the main characters and to track how they change from the beginning of the book to the end. I’d recommend Because of Winn Dixie and Tiger Rising for 4th and 5th grade readers. Because a lot of the character work and theme work is the same across the two texts, it would be interesting to read the former whole-class and then use the latter as a guided book club to teach into these skills with students who may require additional support.